Global warming is bearing down on us with the fire of a thousand suns, and soon, the arctic chill of like a billion perfect storms. Whatever is Jake Gyllenhaal to do? Hole up in a Polar City, of course. Envisioned by "visionary futurist" Dan Bloom—how would he know he's a visionary unless he, in fact, is one—the first model polar city will begin construction in 2012 in Norway, with "volunteer testing occupancy" starting in 2015. And no, you earth-hating, global-warming-denying Bush lackeys, he is NOT a "a little Dr. Evil," "plain far-fetched" or a "just lone wacko day dreamer." He tells us so in the self-authored press release, which we have below. Model "Polar City" for possible survivors of global warming in distant future set to be built in Norway in 2012; first international volunteer residents will move in in 2015. In the event of catastrophic global warming events in the far distant future, humankind might have to find refuge in a group of polar cities lying within the Arctic Circle in such countries as Canada, Norway, Finland, Russia Greenland, Iceland, Sweden and the USA (Alaska). Under such circumstances, the founders of the Polar Cities Research Institute, led by visionary futurist Dan Bloom, 59, have announced that they will build a model polar city in Longyearbyen, Norway, with construction set to begin in 2012 and "volunteer testing occupancy" in 2015. The Model Polar City Project was set up in January 2008 by various architects, civil engineers, industrial engineers, urban planners and scientists from around the world. The founders have already made initial contact with British, American, Japanese and UAE private investors interested in investing in the project. The first model Polar City will be built in Longyearbyen, Norway and will be ready for its first volunteer residents in 2015. Construction is scheduled to begin in 2012, according to project engineers. insists that he is not a doomsayer or a gloom-and-doom survivalist, but rather "an eternal optimist who cares about the future of humankind". Bloom says the model polar city will be a scaled-down version and will test residents' willingness to live in such an environment in the future. Lest you think Bloom is just a lone wacko day dreamer, he has company. He claims to be backed by an unnamed US firm that firmly believes this would be a step in the right direction. Bloom says he is also in talks with other financiers from Japan, Britain, Norway and the United Arab Emirates. The 2012 configuration will be suitable to house 100 volunteer residents. Bloom says that the system is designed for modularity and expansion "based on the natural growth of a grapevine." 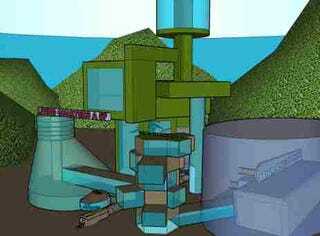 Bloom's current concept artwork depicts blueprints of what a polar city might look like when completed: http://pcillu101.blogspot.com. Bloom told Reuters that while he believes there are many people on Earth who will be curious to know more about polar cities, and that the time is good now to test a model polar city in public. Bloom says residents will also take part in scientific experiments, but without elaborating on this part of the residency.